The crisis of leadership today is the mediocrity or irresponsibility of so many of the men and women in power, but leadership rarely rises to the full need for it . . . We fail to grasp the essence of leadership that is relevant to the modern age. The disgraceful misconduct by executives and employees of banks and financial institutions uncovered by the Australian Banking Royal Commission exposes a crisis in leadership on many fronts. Much of the conduct by the banks and financial institutions was unlawful although little was done by the regulators to enforce the law adequately. The usual response by politicians is to introduce new laws but as Barry Schwartz says, making more rules is not the answer. Commissioner Hayne agrees, saying, “The law already requires entities to ‘do all things necessary to ensure’ that the services they are licensed to provide are provided ‘efficiently, honestly and fairly’.” He says adding new laws only complicates an already complex regulatory environment. 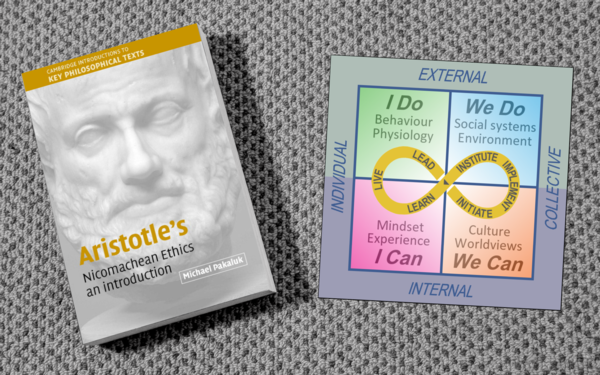 What does Aristotle tell us about ethics and leadership? Aristotle is recognised as one of the most influential philosophical thinkers of all time. Historian Will Durant acknowledges his contribution by suggesting, “No other mind had for so long a time ruled the intellect of mankind. His writings on Ethics and Politics remain as two of his most relevant works, particularly for today’s leaders and for the population at large, to help overcome the crisis of leadership. Fundamentally, ethics refers to standards of behaviour for human beings to act in the many situations in which they find themselves. This includes the various roles we play in our lives as parents, friends, citizens, businesspeople, teachers, professionals, politicians and so on. For Aristotle, the purpose of ethics was to achieve the ultimate purpose of human life: eudaimonia, a Greek word commonly translated as happiness. The meaning of happiness here is not just the internal emotional state as we know it, but includes the externalities of prosperity, friendships based on character, and “an unimpeded life of thought and action”. Virtue for the Greeks means excellence. A person of virtue is someone who performs human activities well. In Book II of the Nicomachean Ethics, the man with character excellence does the right thing, at the right time, for the right reason. Aristotle identified two kinds of virtues: thinking-related intellectual virtues and character-related moral virtues. According to philosophy professor Julia Driver, intellectual virtues are those that produce epistemic goods of value internally for oneself, such as knowledge, understanding and wisdom, while moral or ethical virtues are character traits that promote externally the flourishing or well-being in others. Using the Can-Do Wisdom Framework helps to show where these two kinds of virtues are positioned in relation to the I Can, I Do, We Can and We Do quadrants. Aristotle refers to practical wisdom as being based on rationality. It operates in the rational domain. In the relationship domain, Aristotle considers politics in two ways: from the point of view of citizen and as a statesman. Both operate in the I Can and I Do quadrants. The role of the statesman or leader is to use this practical wisdom for the Collective—the polis or the organisation—in the We Can and We Do quadrants. 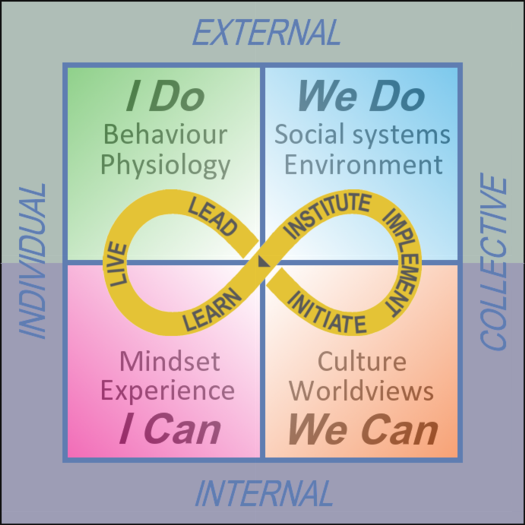 In living systems these four quadrants are interconnected by the activities of learn-live-lead for an individual and initiate-implement-institute for the collective. This change-loop pathway takes the form of an infinity symbol—a never-ending learning and change loop—as shown in the figure above. In the individual quadrants, I Can and I Do, Learn includes the intellectual virtues, while Live includes the moral virtues, and Lead delivers change initiatives to the collective quadrants, We Can and We Do. Whether consciously or not, we’re always learning. Aristotle once said, “All men by nature desire to know.” He’s suggesting that all human beings are born curious and that’s certainly true when one observes the behaviour of infants and toddlers. As learners we start with inquiry. It is an active process involving observation, imagination, reading, interpreting, reflecting, analysing, assessing, formulating, and articulating. The skills involved here are basically thinking skills. The character traits of a good thinker include curiosity, open-mindedness, attentiveness, intellectual autonomy, intellectual humility, and intellectual tenacity. This thinking in the I Can quadrant extends to thinking about how one should act, about how to make something, or thinking about truths. Thus, Aristotle divides intellectual virtues into two sorts: those that pertain to theoretical reasoning, and those that pertain to practical thinking. Art or technical skill (techne) involves production according to proper reasoning. Scientific knowledge (episteme) arrives at eternal truths by means of deduction or induction. Prudence or practical wisdom (phronesis) helps us to pursue the good life generally. Intuition (nous) helps us to grasp first principles from which we derive scientific truths. Theoretical wisdom (sophia) is a combination of scientific knowledge and intuition, which helps us arrive at the highest truths of all. Aristotle asserted that intellectual virtue develops primarily through teaching. It occurs most readily in the mature thinker and it takes time and experience before it emerges. Live is the link between I Can and I Do quadrants. It is the pathway for intentions in the I Can quadrant to become actions in the I Do quadrant. Central to Greek ethics is the point that a flourishing human life will encompass virtues. On the other hand, vices are seen as an obstacle to human good. Aristotle distinguishes moral virtue from intellectual virtue by the element of desire: what it is to have moral virtue is to have a disposition to desire what is good, as opposed to disposition to elicit truth for an intellectual virtue. Another difference Aristotle points out is that moral virtue owes its development in an individual to habit. Moral or ethical virtues include, among others, justice, courage and temperance. 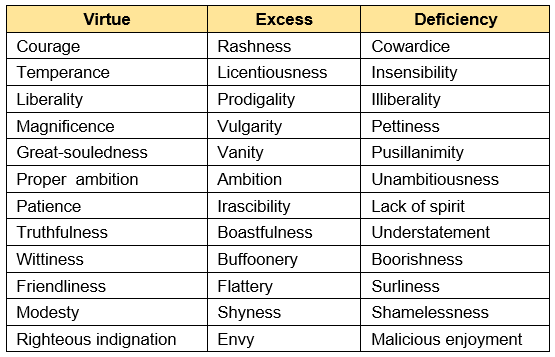 Each virtue is associated with two vices of excess and deficiency at the extremes. For example, we find rashness as an over-reaction to the disposition to be courageous, while cowardice is an under-reaction. For example, fear, confidence, appetite, anger, pity, and in general pleasure and pain can be experienced too much or too little, and in both ways not well. But to have them at the right time, about the right things, towards the right people, for the right end, and in the right way, is the mean and best; and this is the business of virtue. Among Aristotle’s list of moral in Table 1 are some that we would not consider relevant today. For example, pride associated with greatness of soul is less admired than humility in Western societies. There are other virtues that, today, we would consider missing from Aristotle’s list. An example would be self-sacrifice. Aristotle is careful not to come up with rules for finding the mean point. It depends on the situation. It requires practical wisdom of the intellectual virtues. How one lives, then, is modulated by practical wisdom. It’s important to realise that leadership can be shared and covers meeting of current objectives of the group or organisation as well as ensuring the organisation is prepared to meet future challenges. These current objectives are and how they are being met is critically important. This gets back to understanding the purpose, or what Aristotle referred to as the telos of the organisation, and then as to how stakeholders interests are to be met. The misconduct of the banks and financial institutions leading up to the Global Financial Crisis (GFC) and what has been exposed at the Australian Banking Royal Commission shows that the purpose of these organisations has been changed to focus on profits first. The how they have gone about their business of achieving their profits has included illegal and unethical conduct. As Schwartz noted, much of the problems relate to the use of financial incentives to achieve results. Hartman also makes the point that financial incentives drive out virtue-related incentives. He posits that individuals who focus on their compensation and not on the value they should provide or fulfill any ethical obligation to the organisation will be less productive. It’s interesting to note the comment by the chairman of the National Australia Bank, Dr. Ken Henry, suggesting it could take up to ten years for the wayward culture of the bank to be fixed. In his book Politics, Aristotle refers to leaders as rulers and describes the many forms leadership can take. Most books on Aristotle and leadership cite practical wisdom as the key. This was explored in my Barry Schwartz blog post. The essence of leadership is to achieve the intended objectives efficiently (scientific mission), motivate and develop people (artistic mission) and pursue the common good (ethical mission). What can we do about the banks? The disclosures at the Banking Royal Commission highlight a failure of responsibilities by the banks and financial institutions as well as the regulators. What we’ve seen is irresponsible lending practices, a focus on short-term results, a disregard by executives and employees for ethics and laws, and a corporate culture characterised by self-indulgence and greed, encouraged by financial incentives. Customers are treated with disdain while the focus is on returns for shareholders. When we talk about responsibility in the West, we tend to focus on individuals as being solely responsible for their decisions. And so, recognition and justice demands that we praise and reward good actions while we condemn and punish anti-social or evil acts. On this basis the typical business ethics program is aimed at individual employees with clear guidelines on what is acceptable and ethical behaviour. Instead of an ethics program focused solely on the individual, this approach also includes the collective. All four quadrants are used to address these issues of responsibility: individual-internal, individual-external, internal-collective and external-collective. I Can quadrant: Cultivation of a personal consciousness of responsibility, and virtues via meditation, contemplation, reflection, self-management. I Do quadrant: Development of responsible practices and actions & ethical behaviour via training, coaching, knowledge, learning, competencies. We Can quadrant: Cultivation of organisational community & culture of responsibility, via consensus-based decisions, values, norms & Personnel Development / Organization Development. We Do quadrant: Development of systems of responsibility, via institutionalisation, rules, policy guide- lines. codices, auditing procedures, resources. This method of analysis, the consideration of the purpose and the conclusions by Küpers is an excellent example of how Aristotle would have approached these issues based on practical wisdom. Although Aristotle lived in different age, his writings on ethics and virtues–with some adaption to our current age—are very relevant today. Royal Commission into Misconduct in the Banking, Superannuation and Financial Services Industry, Interim Report, Volume 1 (Canberra, 2018), xix. Will Durant, The Story of Philosophy: The Lives and Opinions of the Great Philosophers (New York: Time Inc., 1962), 89. Leonard Peikoff, “Aristotle’s Ethics and Politics: Happiness, Reason and the Ideal Society,” History of Philosophy, Lesson 20 (Ayn Rand Institute) Transcript, https://campus.aynrand.org/campus/globals/transcripts/aristotles-ethics-and-politics-happiness-reason-and-the-ideal-society. Aristotle, The Nicomachean Ethics: Translated with Commentaries and Glossary by Hippocrates G. Apostle (Dordrecht, Holland: D. Reidel Publishing Company, 1975), 1098a16–17. John Bradshaw, Reclaiming Virtue: How We Can Develop the Moral Intelligence to Do the Right Thing at the Right Time for the Right Reason (New York: Bantam Books, 2009). Jason Baehr, The Inquiring Mind: On Intellectual Virtues and Virtue Epistemology (Oxford: Oxford University Press, 2011), 221. Aristotle, Metaphysics: Translated by W. D. Ross (Adelaide: eBooks@Adelaide, 2015), 1. Baehr, The Inquiring Mind, 1. Jason Baehr, ed., Intellectual Virtues and Education: Essays in Applied Virtue Epistemology (New York: Routledge, 2016), i.
Cathleen K. Stutz and Susan M. Tauer, “The Awakening of Intellectual Virtue,” The Journal of Education 182, no. 2 (2000): 37–43. Roger Crisp, ed., How Should One Live? : Essays on the Virtues (Oxford: Oxford University Press, 1996), 6. Gabriele Taylor, “Deadly Vices?” in How Should One Live? : Essays on the Virtues, ed. Roger Crisp (Oxford: Oxford University Press, 1996), 111. Marguerite Deslauriers, “How to Distinguish Aristotle’s Virtues,” Phronesis 47, no. 2 (2002): 101–126. Aristotle, Nicomachean Ethics: Translated and Edited by Roger Crisp (Cambridge : Cambridge University Press, 2004), 30. Bill Pollard, “Aristotle’s Nicomachean Ethics,” Philosophy 2B, 2006-7 (University of Edinburgh), http://citeseerx.ist.psu.edu/viewdoc/download?doi=10.1.1.404.8672&rep=rep1&type=pdf. Michael Lacewing, “Aristotle on virtue,” A Level Philosophy, http://www.alevelphilosophy.co.uk/handouts_ethics/AristotleVirtue.pdf. Gary Yukl, Leadership in Organizations, 7th ed. (Upper Saddle River, New Jersey: Prentice Hall, 2010), 8. Barry Schwartz, “Practical wisdom and organizations,” Research in Organizational Behavior 31 (2011): 3–23. Edwin M. Hartman, Virtue in Business: Conversations with Aristotle (Cambridge: Cambridge University Press, 2013), 178. Sarah Danckert and Clancy Yeates, “NAB’s culture could take 10 years to fix, chairman says,” Sydney Morning Herald, Nov 26, 2018, https://www.smh.com.au/business/banking-and-finance/nab-s-culture-could-take-10-years-to-fix-chairman-says-20181126-p50igk.html. Sheila McNamee and Kenneth J. Gergen, Relational Responsibility: Resources for Sustainable Dialogue (London: Sage Publications, 1999), 8. Ian Burkitt, “Relational Moves and Generative Dances,” in Sheila McNamee and Kenneth J. Gergen, Relational Responsibility: Resources for Sustainable Dialogue (London: Sage Publications, 1999), 73. Wendelin M. Küpers, “Integral Responsibilities for a Responsive and Sustainable Practice in Organization and Management,” Corporate Social Responsibility and Environmental Management 18, no. 3 (2011): 137–150, doi: 10.1002/csr.272. Wendelin Küpers and Jürgen Weibler, “Inter-leadership: Why and How Should We Think of Leadership and Followership Integrally?” Leadership 4, no. 4 (2008): 443–475. Posted in practical wisdom and tagged aristotle, banking royal commission, ethics, leadership, practical wisdom, virtues.